LAWRENCE — KU Libraries are pleased to announce the 2018 recipients of the Shulenburger Award for Innovation & Advocacy in Scholarly Communication. They are Donna Ginther, professor of economics and director of the Center for Science Technology & Economic Policy, and Jonathan Perkins, director of the Ermal Garinger Academic Resource Center (EGARC). 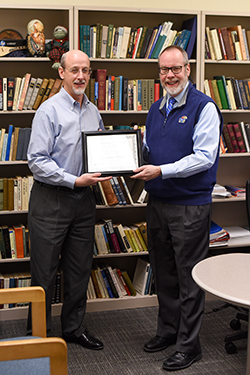 Granted annually, the Shulenburger Award recognizes KU staff, faculty, students and academic departments that demonstrate outstanding efforts to facilitate open access by creating a variety of open channels for public communication between scholars and community members around the globe. Former KU Provost and Executive Vice Chancellor David Shulenburger, a longtime advocate for open access, established the award with a private gift in 2014 to recognize exceptional advocacy and innovation in the scholarly communication system. 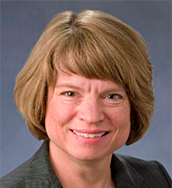 The award committee noted Ginther’s work to bring open design thinking to STEM and social sciences research – specifically the report she helped author, titled “Open Science by Design: Realizing a Vision for 21stCentury Research” – as well as a strong record of open access publication, peer review of open journals and advocacy with early career researchers. Nominators highlighted Ginther’s expertise on the economic barriers to open science. Ginther is also an affiliate professor with the School of Public Affairs & Administration. Perkins was selected for his long-standing and significant commitment to open access. The award committee noted Perkins’ support for the development of open education resources in language learning. Nominators highlighted his role in securing a highly competitive Language Resource Center grant from the U.S. Department of Education. In addition to his work in EGARC, Perkins is the associate director of the KU Language Training Center and co-director of the Open Language Resource Center.